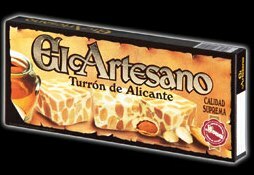 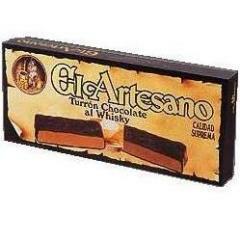 Hard 'Alicante' Nougat, Made with 60% Almond. 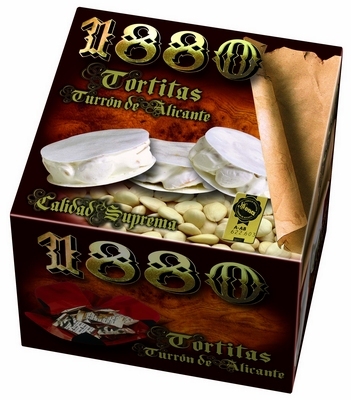 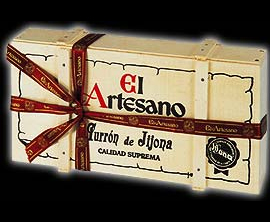 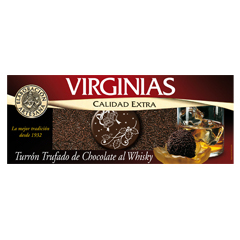 Turron JiJona Calidad Suprema envase 300 g from Spain. 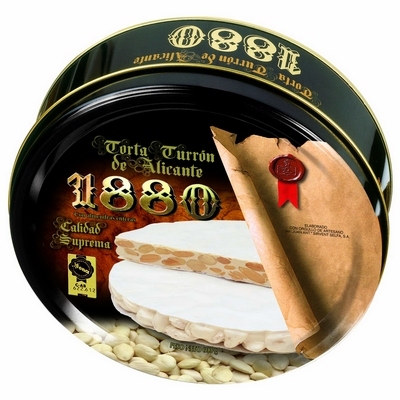 Turron Alicante another guarantee of our quality is that all the nougat we produce carrys the seal 100% natural that means free from any artificial additives of preservatives. 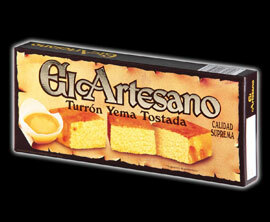 Turron Yema Tostada 300 grAlmond and Caramel Egg yolk turron. 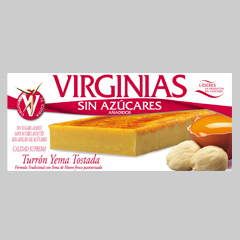 Ingredients: Sugar, almonds, egg yolk, water, stabilizer, glucose syrup, preserving and coloring agents. 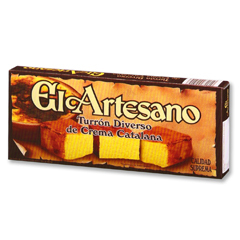 Elaborated in a company that uses other tree nuts, wheat and milk. 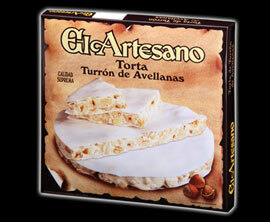 Almendras Rellenas 100 gr 3.05 oz Almond shaped wafer, stuffed with a soft nougat cream. 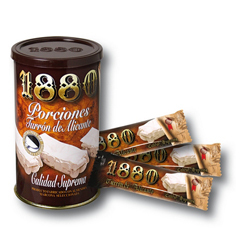 3.5 oz = (10 cakes x 0.35 oz)'1880' mini brittle cakes are the perfect single portion sweets. 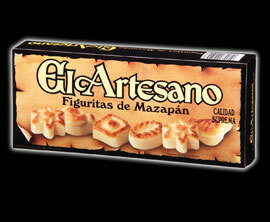 They are made of whole almonds and honey. 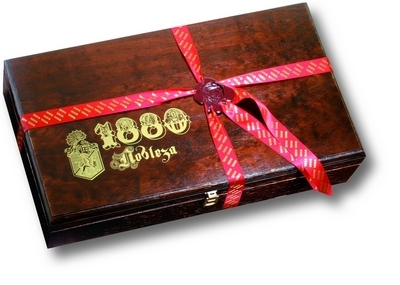 There is no need to cut. 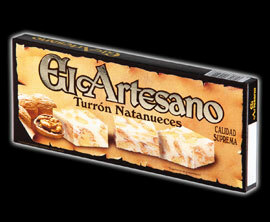 Soft nougat made with almond, cinnamon and lemon. 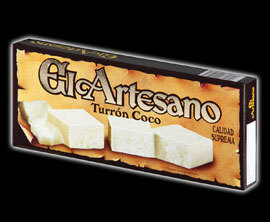 Toasted hazelnuts (60%), sugar, honey, egg white and wafer. 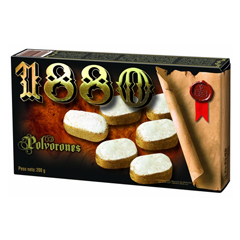 '1880' almond crumble cakes, also known as Polvorones. 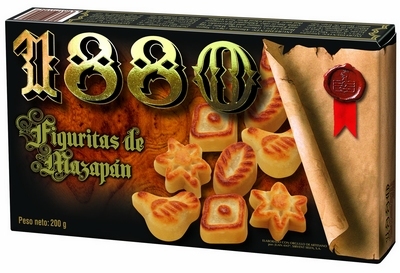 Made of toasted flour and covered in sugar powder. 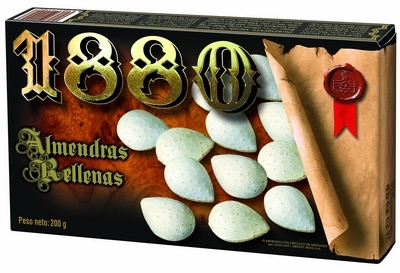 '1880' almond creme in a wafer shell, shaped like an almond. 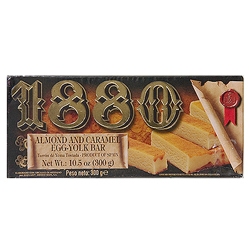 10.5 oz - 300 g'1880' almond and caramel egg-yolk bar. Gluten free. 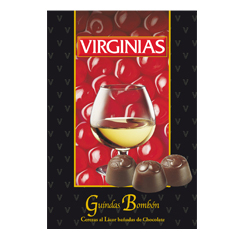 Bon-bons filled with cherry in liqueur. 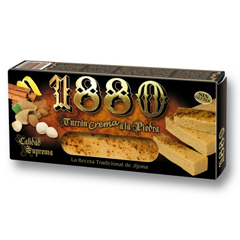 Almond and cinnamon soft bar '1880', a la piedra. 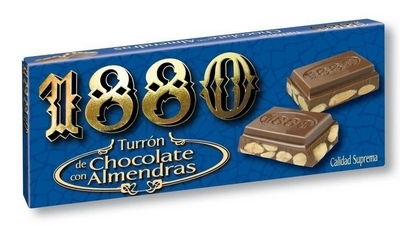 10.5 oz - 300 g'1880' 70% dark chocolate and almond bar. 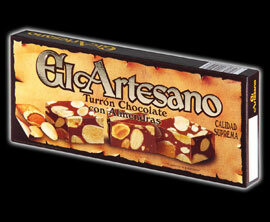 A smooth layer of milk chocolate covers the whole Marcona almond into this delicious bar. 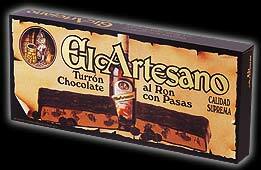 It's 70% of cocoa content makes it less sweet than other chocolate bars. 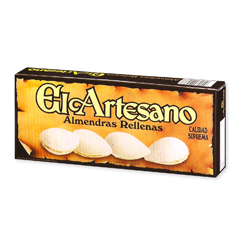 It is high on unsaturated fat from the Marcona almonds. 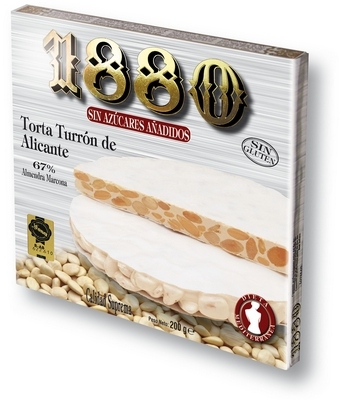 '1880' almond and honey brittle cakes, made with Marcona almonds. 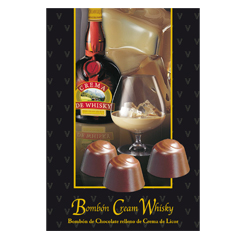 This gift tin presentation comes with three 7-oz brittles. 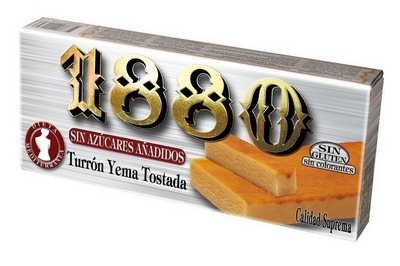 87 oz - 2.5 Kg approx. 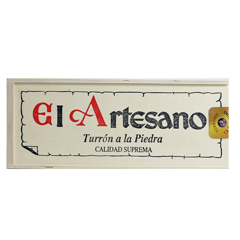 Soft bar Jijona, almond and honey brittle Alicante, Caramel egg-yolk bar, almond and honey brittle cake, sugar almonds Peladillas, sugar pine nuts Piñones, Almond delights, sugar fruit, milk chocolate and almond bar, and crunchy chocolate bar. 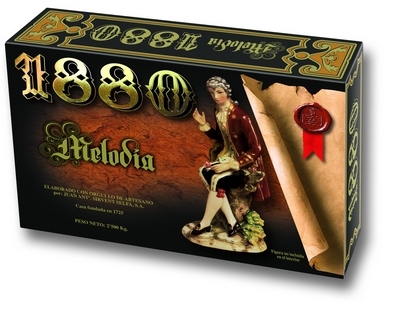 Box measures: 17.7" x 4" x 12.2"
10.5 oz - 300 g'1880' milk chocolate and almond bar. 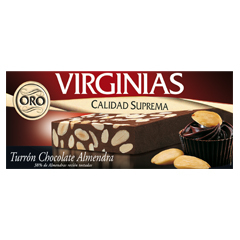 A smooth layer of milk chocolate covers the whole Marcona almond into this delicious bar. 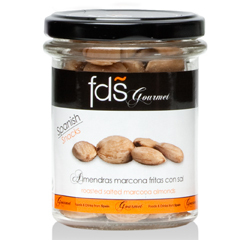 High on unsaturated fat from the Marcona almonds. 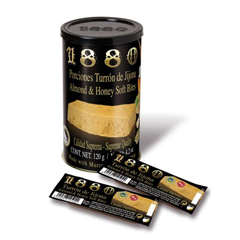 7 lb 2.6 oz - 3.25 Kg approx. 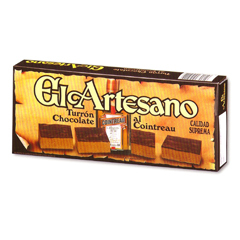 Soft bar Jijona, almond and honey brittle Alicante, Caramel egg-yolk bar, almond and honey mini brittle cakes tin, Creme nougat a la Piedra, Almond delights, marzipan, almond and honey brittle cake, chocolate and almond cake, chocolate-almond-sesame seeds bar Terronico, and crunchy chocolate bar. 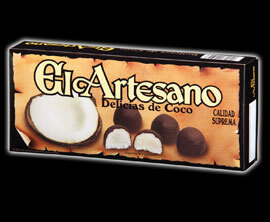 Box measures: 23.6" x 13.4" x 4.7"
4.2 oz - 120 g (6x20 g)'1880' portion-size caramel egg-yolk nougat. 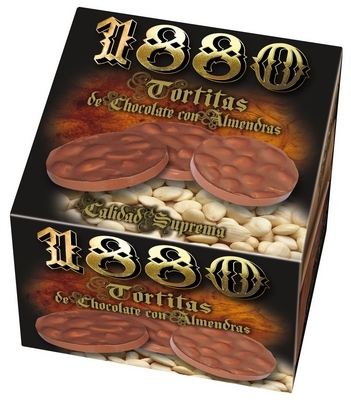 6 individually wrapped portions of 0.7 ounces each, presented in a gift tin. 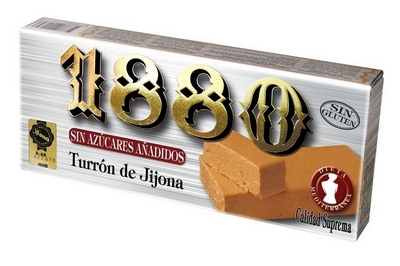 4.2 oz - 120 g (6x20 g)'1880' portion-size hard nougat made with almonds and honey. 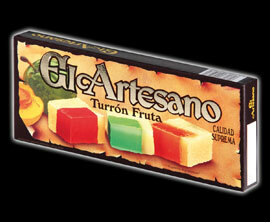 6 individually wrapped portions of 0.7 ounces each, presented in a gift tin. 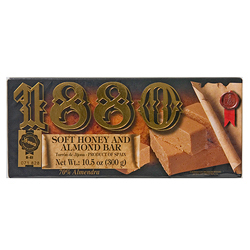 '1880' portion-size soft nougat made with almonds and honey. 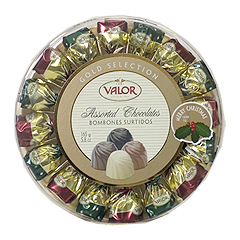 6 individually wrapped portions of 0.7 ounces each, presented in a gift tin. 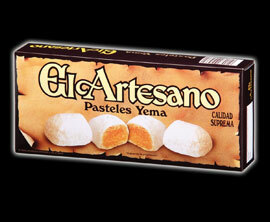 Marcona almonds cooked and salted. 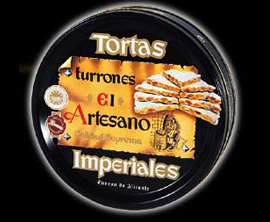 Presented in a glass jar. 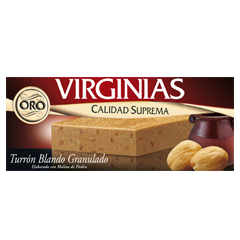 10.5 oz - 300 g Soft almond and honey bar. 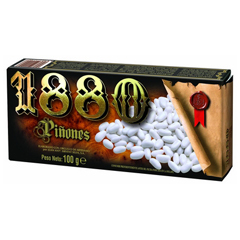 '1880' pinenuts covered in a shell of sugar. 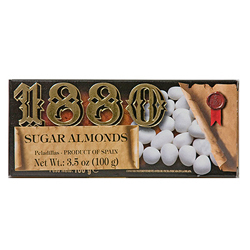 The same taste and quality of traditional '1880' almond soft bar, but with no sugar added. 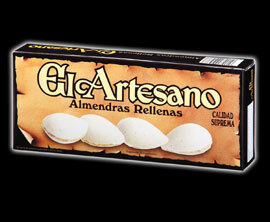 No cholesterol, less calories, and high on unsaturated fat from the Marcona almonds. 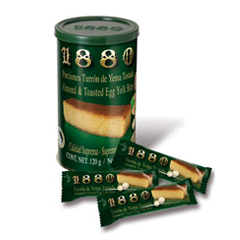 The same quality of the traditional '1880' caramel egg-yolk bar, but with no sugar added. 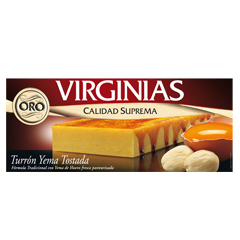 The recipe has a higher percentage of egg-yolk and almond than the regula bar. 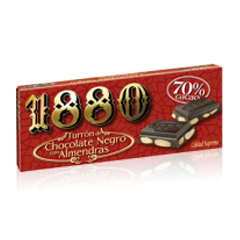 200 g - 7 oz No sugar added.